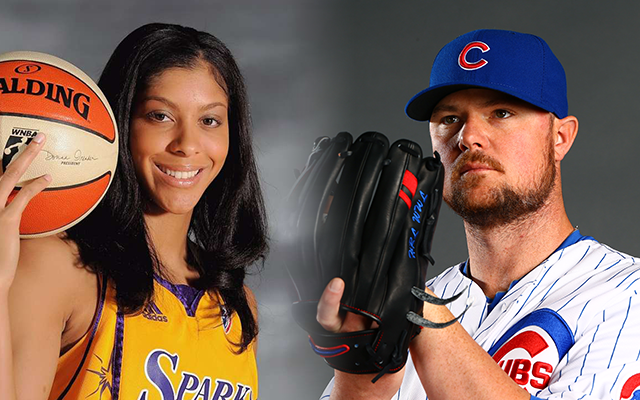 Chicago Cubs pitcher Jon Lester and Los Angeles Sparks basketball player Candace Parker have been voted the United States Sports Academy’s Male and Female Athletes of the Month for October. Lester had a 3-1 record with a 1.93 ERA and 26 strikeouts in October postseason play, which includes the playoffs and World Series. Lester was named the co-MVP of the National League Championship Series after going 2-0 with a 0.86 ERA and 14 strikeouts in 21 innings against the Los Angeles Dodgers. Parker was named the Women’s National Basketball Association (WNBA) finals MVP as she helped the Los Angeles Sparks capture the WNBA title in Game 5 on 20 October 2016. She scored 28 points and grabbed 12 rounds in the title game against the Minnesota Lynx. There was a tie for runner up in the men’s balloting: Cleveland Indians pitcher Andrew Miller and British tennis star Andy Murray. Miller was selected American League Championship Series (ALCS) MVP after helping the Cleveland Indians win their first pennant since 1997. Miller struck out 14 of the 26 Toronto batters he faced over four games – an ALCS record for a reliever. He gave up three hits in 7 2/3 shutout innings and earned a save in Game 3. In three appearances in the World Series in October, Miller gave up just three hits and one run with eight strikeouts in 5 1/3 innings of relief. Murray defeated Roberto Bautista Agut 7-6(1), 6-1 in the Shanghai Rolex Masters final on 31 October 2016. Murray’s win was his second Association of Tennis Professionals World Tour Masters 1000 title of the season and the 13th of his career. Murray also celebrated his 41st career tour-level title. The runner up in the women’s balloting was Jamaican swimmer Alia Atkinson and third place went to Kenyan marathon runner Florence Kiplagat. Atkinson broke the 50 meter breaststroke short course world record on the final day of the International Swimming Federation (FINA) World Cup leg in Tokyo on 26 October 2016. Atkinson clocked a time of 28.64 seconds to shave 16 hundredths of a second off the former record posted by Jessica Hardy of the United States in 2009. Kiplagat won her second consecutive Chicago Marathon women’s race on 9 October 2016 with a time of 2:21:32, more than two minutes faster than her previous winning time. Kiplagat pulled away from the pack between the 18th and 19th mile, recording a 5:14 split that was eight seconds faster than the men’s pack for the same mile. Eric Mann is the communications assistant at the United States Sports Academy. He can be reached at emann@ussa.edu.